Click Here - to add your name to the Directory of RPCVs. Joining PC was the best decision I ever made in my life! 2-6 who were in Armenia! Wow... I had no idea so many of you were online! What a great resource! I still keep in touch with Christiane Abendroth and Albert Yee if anyone's interested. A3 Armenia, Sead PCV, 95-97 But, I stayed in country until 1999 at USIS. My (Armenian wife) Gayane & I returned to Masschusetts in 1999. We now have an infant son David Jr.
My tiem in PC FOREVE change dmy life. I was able to prove ot myself I could do almost anything. I then found myl ife partner in country, and look back at those 2 years as the BEST ever..
Zack,C. Jan S, Laurel R, all from A3 Armenia 1995-97!Also Mike N from A4 Mike N. and wife and any other married PCV's from Armenia! Go for it...Plus Kids are great..a real joy! I returned to Hayastan in 2001 and it was a real trip down memory lane.. Moved to Las Vegas, NV; married the poet Meredith McGhan; finishing MFA at UNLV. Hello. My name is Deborah Tepley and I am a recent RPCV from Russia (2001-2003). 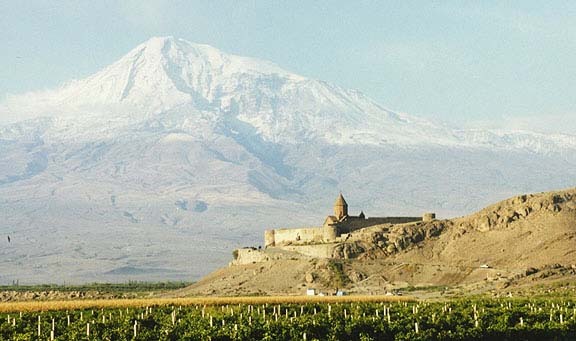 One of my friends in Russia is from Armenia; he would like to contact a PCV who was his teacher in Ararat. Her name is Kate Donnelly (sp?) and she served in Armenia from 1996 to 1998. The first year she was in the city of Ararat, the second year the city of Kirovakan, and she taught English at a translation college/school. She was 20 years old at the time and is from Boston, MA. i gots me a master's degree in economics and am employed as an economist for the missouri public service commission. doesn't really get much more boring than that. missouri is real purty. peace corps was an excellent experience. i think if emotions hadn't gotten in the way, i may have made it to the 27 month mark. as it stands, 9 was the magic number. everyone. vince, april, michelle g, julie j, rebecca, andy, cat, zach. missouri is real purty. we have little mountains here from what remains of the old ozark mountain range. really, they are just little hills. Married life is great! I couldn't have asked for a better husband, although we both would love it if he got an overseas assignment (he's soon to be a Lt. Col. in the Army) because we miss traveling. The day we married, I became a stepmother to three kids (a son and two daughters) aged 15, 12, and 9. They live in AZ with their mom. It would be great to get out of the DC area. Some people marry into the military and move away from home. I married (back) into it and moved back home! I immediately came back to the USA to attend the School for International Training for a MS in International Organizational Management. I just finished work as a Coordinator and trip leader for Cross-Cultural Solutions Insight Cuba Program. Now I am currently looking for a new international work experience. I was Active Duty in the Air Force with a current Peace Corps volunteer and am attempting to find e-mail address for him to see how he's doing. His name is Chuck Specht. I believe he is in Armenia. Graduate Student, George Washington U. 2003-2005; Student Trainee, U.S. Courts 2004-2005; Program Manager, Armenian Assembly of America 2001-2004. Masters in Development Mgmt from London School of Economics-2001, Current Org. Project Office at a Small Enterprise Foundation in South Africa. Wish I knew then what I know now, but PC gave me insights into my studies and current work-chicken or the egg dilemma. You will get a job. Just keep plugging away. I sorted vegetables for a year after getting my Masters before receiving an offer.